When it comes to exercise, no one likes to use the word fail unless we are talking about strengthening our muscles. Working a muscle to failure in a strength training session gives great results in strength and in muscle growth or “hypertrophy”. Our muscles are forced to their max and must adapt to their full potential, so therefore the muscle changes and becomes stronger and bigger – ladies don’t worry – not bulky for us, just toned and defined. Here is how it works. Say you were doing overhead presses and you wanted to work to failure. You keep performing the exercise until you know you can’t repeat another one with good form. This means if the weight begins to feel so heavy your back starts to arch in this exercise, you have gone too far. Never sacrifice form for another rep. As you get accustomed to working in this manner you will begin to understand your limits and what that last rep needs to feel like. Those in the bodybuilding world (which most of us moms are not I know) may differ in opinion on using 1 Rm to get to failure vs. 10-12 RM. RM stands for repetition maximum, and 1 RM means it only took 1 rep to get to failure. So those are some pretty heavy weights we are talking about. I am not a big proponent of 1 RM because I feel it is unsafe to pick up a weight so heavy that I can only lift it once – too easy to pull something or knock your back out in my opinion. There is a more general consensus of failure to 10 RM-12 RM. If you can lift a weight more than 12 times with good form – go heavier. Don’t be afraid to pick up heavier weights -this is the only way to get stronger and more toned. A lot of people tend to stop just short of the failure mark and don’t receive the most benefit from their time exercising. Pushing yourself to the max(in a safe and controlled manner of course) is the path to change. It will be hard especially at first, but your body and mind will become so much stronger. The next time you try this you will know you can accomplish this challenge and succeed. This idea of failure can apply to most strength training exercises, just make sure you have a spotter (someone to assist you)if the moves involve a weight over your head, such as a bench press. If you don’t have that ,which I usually don’t, use the old common sense route. 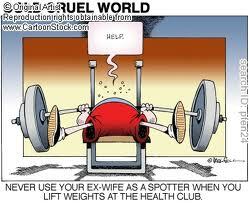 Just be careful anytime you are lifting weights. As with all exercise keeping your muscles guessing keeps the change coming. Change it up! Some days of higher reps to fatigue are great while other days should focus on heavier weights with fewer reps even as low as 6RM. Make your muscles adapt to different challenges! So there you have it – a little bodybuilder talk for us moms. After all, we do have a body we want to build and make strong and healthy right? « Are you ready for bootcamp?